When and why did you first become interested in gymnastics? My parents put me in gymnastics because I had a ton of energy, and my mom noticed I was more muscular than most kids, so gymnastics might be a good fit. Do you have any good/funny memories from when you first started taking gymnastics classes? When I was 7, I lost my first tooth by knocking it out on a handstand on beam. When did you decide you wanted to compete? And, when did you want to compete at a high level? What about competition appeals to you? I loved being in the gym and I learned skills fast, so my coaches thought competing would be a good route for me. Watching Iowa State gymnastics meets in my hometown from a young age made me realize that I wanted to compete in college. I like competing because it gives you a chance to show off what you’ve been doing in the gym. I love the feeling you get when you nail your routine! What is your training regimen? 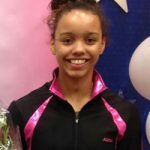 Was that a big change when you made the switch to competitive gymnastics? I train Monday-Thursday, and Saturday for a total of 21.25 hrs. I leave school early every day to get to practice in the afternoon, so I homeschool a couple classes. 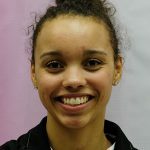 I don’t remember making the switch to competitive gymnastics as a Level 4, but I know the hours increased when I jumped from Level 7 to 9 and switched gyms going into Level 10.
Who is your favorite gymnast or who is your “idol”? I look up to Evy Schoepfer, Kynsee Roby, and Erin Castle. They are my former teammates and competing in college now. How have you grown as a gymnast during your career, both skill wise and mentally? 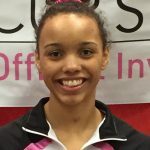 I have become so much more confident in my abilities and realize that I am a unique gymnast, so I shouldn’t compare myself to others all the time. How has gymnastics helped you as a person? It has made me realize how important it is to surround yourself with positive people (inside and outside of the gym). It has also helped me to be disciplined at school – managing my time and working hard to get good grades. If you had to select one life-lesson that gymnastics has taught you, what would it be? No matter how many setbacks you face, use them to motivate you, not stop you. What are your biggest accomplishments or best memories in your career? Qualifying to this competition after being out from ankle injuries for nearly two years. In 2015, placing 3rd AA at the Nastia Cup and then getting my highest ever AA score at the Northern Lights Classic the next day. Do you want to compete in collegiate gymnastics? Yes! What are your goals for the future, both as an athlete and after you are finished competing? I would like to make the JO National Team this year and win a national championship in college. When you’re not in the gym, how do you enjoy spending your time? Do you have any hobbies or favorite activities? Charities? I like hanging out with my friends, baking and watching Netflix. I volunteer at Food at First – the local food pantry/kitchen, the hospital, and mentor a girl through our county’s youth mentoring program. What’s on your IPod right now? What type of music do enjoy listening to? How about before a meet when you’re trying to get focused and pumped up? I have a bunch of different genres on my phone. Before a meet I have a “MEET DAY” playlist that I listen to with songs by MAX, Beyoncé, and Future. In Kindergarten during one of practices, I knocked out my two front teeth doing a headstand on the beam. I don’t know how I did it, I just remember standing on the beams mats afterwards. I was pretty young when I was selected for the competitive team. I don’t think I really chose to compete; I just loved being there. I love competing because you get to show off the skills that you have been working so hard on. I practice 26.5 hours a week; Monday through Saturday and I leave [school] everyday at 1 p.m. for gym. I don’t really remember how big the change was, but I’m guessing that the hours doubled! When I read “Off Balance” by Dominique Moceanu, she became my favorite gymnast. I was amazed by how much she overcame in her lifetime. I also look up to certain girls in the gym because they work so hard. I have become much more confident in my skills and abilities. I’ve accomplished so much more that I thought I could have a few years ago. It’s taught me to persevere through the hard times and to work hard at everything you do. I’ve also learned to manage my time between school, gym and other activities. With confidence and hard work, you can achieve anything you put your mind to. Winning vault at J.O. Nationals last year, winning Level 9 Regionals and qualifying for the Nastia Liukin Cup twice. This year, I want to place in the top four at J.O. Nationals, in order to make the national team. After I’m done competing, I want to find a job that I enjoy doing and become more involved in charity work. I enjoy baking, reading, doing crafts and shopping. My sister Aliyah is a compulsory gymnast at Triad. I always wear a certain pair of sock and the same three clips and chapstick to the meet. I like listening to pop music, and I also have a motivational playlist that I listen to before meets. “Hallelujah” is on it to remind me that God can help me through anything. Q: Do you have any good/funny memories from when you first started taking gymnastics classes? Q: When did you decide you wanted to compete? What about competition appeals to you? Q: When you’re not in the gym, how do you enjoy spending your time? Do you have any hobbies or favorite activities? Q: If you had to pick three words to describe yourself as a gymnast, what are they? Q: What three words describe you as a person, not the gymnast?